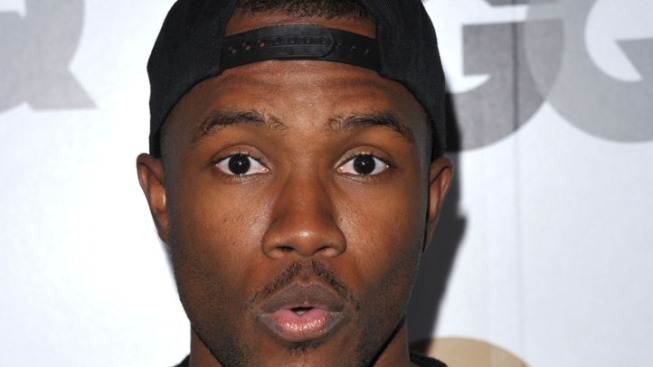 A recent altercation in a parking lot with Chris Brown only focused more attention on Frank Ocean. Everybody's thinkin' about Frank Ocean. Ocean is a cause celebre and the man with the momentum as Sunday's Grammy Awards approach. One of six top nominees with six nominations apiece, the 25-year-old R&B singer turned cultural talking point will have the music world's attention. It remains to be seen if it will be the "Thinkin Bout You" singer's night, but there's no question he's dominated the discussion so far. Already a budding star with a gift for building buzz as well as crafting songs, Ocean was swept up by something more profound when he told fans his first love was a man last fall as he prepared to release his major-label debut, "channel ORANGE." "It speaks to the advancements of our culture," renowned producer Rick Rubin said. "It feels like the culture's moving forward and he's a representative of the new acceptance in the world for different ideas, which just broadens (our experience), makes the world a better place." Don't hand Ocean those trophies just yet, though. R&B and hip-hop performers (Ocean is part of the Odd Future collective) have had a spotty history at the Grammys recently when it comes to major awards. Only one R&B act has won album of the year this century, and it's hard to even call him just an R&B act given his legend, artistic scope and material: Ray Charles for his "Genius & Friends," an all-star collaboration that was honored posthumously. Also limiting Ocean's chances for a clean sweep are his fellow top nominees. Most are riding waves of their own. Fun. became just the second act to sweep nominations in all four major categories with a debut album, equaling Christopher Cross' 1981 feat. Like Cross' "Sailing," the New York-based pop-rock band has ridden along on the crest of an inescapable song: "We Are Young," featuring Janelle Monae. Cross won five Grammys, sweeping the major awards. Fun. likely will have a much harder time piling up that number of victories because of the buzz surrounding the group's competitors. It's not just Ocean who has people talking. London-based folk-rockers Mumford & Sons had one of the top-selling albums of the year with "Babel" and already has a history with The Recording Academy's thousands of voters, having been nominated for major awards the year prior. Also, The Black Keys have a winning track record at the Grammys. And don't count out West and Jay-Z, who were shut out of the major categories but remain very much in voters' minds. Jack White's "Blunderbuss" competes with fun. 's "Some Nights," Ocean's "channel ORANGE," Mumford's "Babel" and The Keys' "El Camino" for the night's top award, album of the year. Gotye's "Somebody That I Used To Know," featuring Kimbra, Taylor Swift's "We Are Never Ever Getting Back Together" and Kelly Clarkson's "Stronger (What Doesn't Kill You)" join the fun., Ocean and Black Keys entries in record of the year. Fun. and Clarkson also are nominated for song of the year along with Ed Sheeran's "The A Team," Carly Rae Jepsen's "Call Me Maybe" and Miguel's "Adorn."